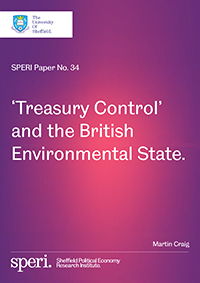 SPERI is pleased to publish a paper by Martin Craig, SPERI Research Fellow, which explores the negative impacts of H.M. Treasury powers and policy priorities on the development of the British ‘environmental state’. A growing literature uses the term ‘environmental state’ to refer to the new roles and institutional capacities that the modern capitalist state has acquired in relation to the environment and the unfolding ecological crisis. The paper considers the implications of the Treasury for the British environmental state’s ability to have a transformative impact. The Paper argues that recent incursions by the Treasury into environmental, energy and industrial policy can be seen as part of a broader strategy to repair the pre-2008 accumulation model, reflecting a historical tendency on the part of the Treasury to stress minimally adaptive accumulation model repair over transformation. In the process, the institutional capacities through which the British environmental state might be used to pursue a ‘green industrial strategy’ and bring about an ecological transformation of that accumulation model are being sacrificed. To illustrate this, the Paper examines four case studies related to changes to environmental taxes, the tax regime around fossil fuel extracting industries, renewable energy subsidies and the Green Investment Bank. On the basis of these it concludes that a better understanding of the factors that shape the Treasury’s policy preferences is necessary if we are to understand how a substantive and effective environmental state can be built in the British context.